UB Machine has been a major supplier of racing suspension components for more than 15 years. Lightweight, swedged steel tubes are knurled for positive gripping. 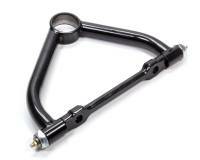 Black powder coated trailing arms / strut rod tbes are available in a variety of sizes. UB Machine lightweight, swedged steel tubes are knurled for positive gripping. Black powder coated trailing arms / strut rod tubes are available in a variety of sizes. Ball Joint Plates for fabrication of control arms and reinforcing control arm mounts for added strength. Caster slugs are used in the Slotted Cross Shaft of Upper Control Arms alowing you to fine tune your caster settings with out needed washers. UB Machine 3/4" Monoball Housing - 1.75" O.D. x .875" Long x 1-7/16" I.D. UB Machine 5/8" Hi-MisAlignment Mono Ball Housing - Hab-10T - 1.75" O.D. x .875" Long x 1.375" I.D. UB Machine Adjustable Panhard Bar Mount - Fits Ford 9"
Pit Stop USA is The Online Motorsports Superstore! UB Machine has been a major supplier of suspension components for the stock car racing industry for more than 15 years. UB Machine has the most innovative and highest quality products on the market. UB Machine offers a wide variety of racing components including lug nuts, wheel studs, dust covers, wheel adapters, upper control arms, lower control arms, mono ball lower control arms, wheel spacers, wheel supports, hat inner shaft style control arm parts, GM Metric control arms, adjustable upper control arms, heim joint upper control arms, lower control arms, lower control arm parts, dirt style lower control arms, asphalt style lower arms, UMP lower control arms, shock mounts, upper coil over shock mounts, clamp-on shock mounts, clamp-on weight mounts, square tube clamps, rear shock mounts, shock mount spacers, steering parts, steering couplers, steering u-joints, steering linkage, stabilizer bars, sway bars, sway bar adjusters, ball joint sleeves, trailing arms, tire rods, rear suspension parts, floater parts, tube clamps, panhard bars, panhard bar mounts, panhard bar replacement parts, center section brackets, swing arms, spacers for center section brackets, spear rods, torque arm brackets, track locator brackets, monoball housings, motor mounts, motor plate mounting tabs, chassis tabs, body mounting tabs, camber shims, upper control arm mounts, anti-dive slugs, formed mounting brackets, battery boxes, weld nuts, step spacers, tapered spacers, spacers for center section brackets, shock mount spacers and much more. We feature UB Machine suspension components at low everyday prices!